It’s that time of the season again, the first final, a trip down to Letchworth this morning, The County Ground once again hosting the Hertfordshire Women’s Challenge Cup with holders Stevenage Ladies taking on Watford Ladies U23s. FAWNL South East Division One side, Stevenage Ladies looking to retain the Hertfordshire Women’s Challenge Cup for a 3rd successive season. Have dominated the competition in recent seasons with this being a fifth successive final appearance, winning 3 of the previous 4 finals. Strong in their defence of the County Cup an established side now in the FAWNL. Have had their fair share of injuries, including captain Paige Logie out with a season ending ACL injury. Watford Ladies U23s entering the competition for the first time this season. Watford themselves dominating the County Cup in its early years 5 times winners in 2005,2006,2007, 2008, 2010, reached all but one final between 2005 & 2013. Not entering the competition during their FAWSL years a Watford Ladies Development side won the competition 3 seasons ago beating Stevenage prior to their back to back successes. 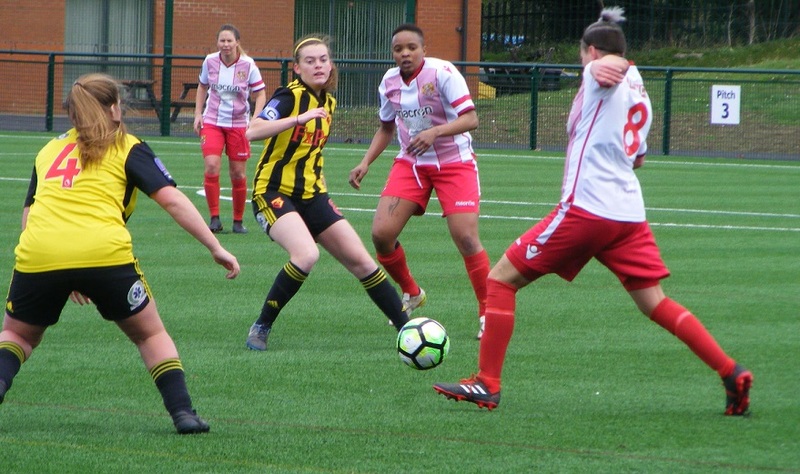 Watford Ladies U23s play in the FAWNL Reserves South/South East Division. Have goal scorers throughout their squad with several players getting their chance with the 1st team. A bye for both sides in the 1st Round of the competition. Both were at home in the 2nd Round both progressing with ease as they racked up double figure wins. Stevenage Ladies were playing Beds & Herts Division Two side, Hitchin Belles. A overwhelming win with the hosts scoring 16 goals on their way to the quarter finals. 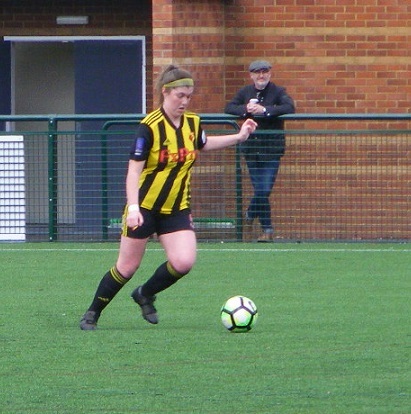 Watford Ladies U23s were at home to Stevenage Ladies Reserves side, 8 different goalscorers, with Jessica Biggerstaff scoring a hat-trick as Watford advanced with a 12-1 victory. Home draws for both sides once more in the quarter finals, Stevenage Ladies up against Royston Town Ladies. The ERWFL Premier Division side County Cup finalists in the 2016/17 season. Stevenage coming out on top recording a good win over Royston winning 7-2 to reach the last 4. 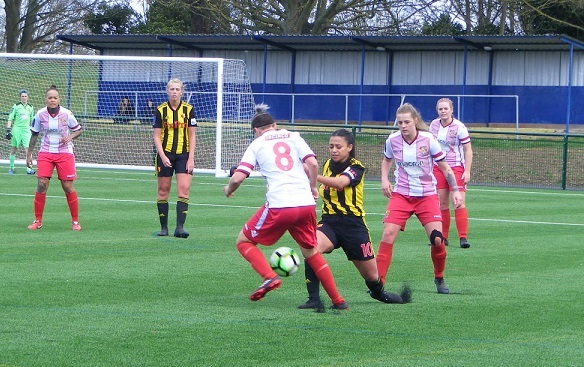 Watford were taking on another ERWFL Premier Division side, Colney Heath Ladies in the quarter finals a 5-0 win seeing them book their place in the semi-finals of the competition. Stevenage Ladies were away for the 1st time in the County Cup drawn away to ERWFL Division One side, Hoddesdon Town Owls Ladies. A repeat of last season’s final Stevenage retaining the trophy with a comfortable win then 8-0 to lift the trophy. Once again the FAWNL side were dominant as they reached their (insert) final with a 7-0 win. 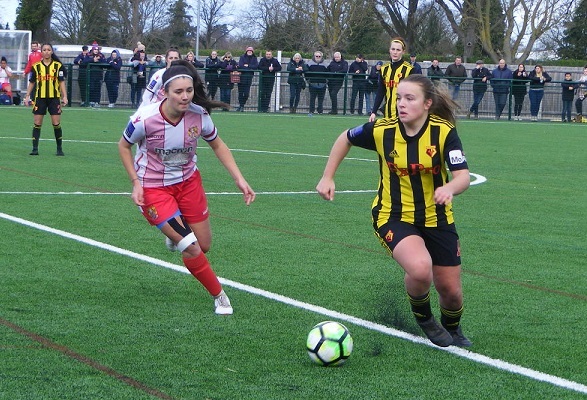 Watford again at home as they took on Beds & Herts Division One side Hemel Hempstead Town Ladies in the semi-finals, a 3-0 lead at half-time went on to win the game 8-0 with six different names on the scoresheet. The County Ground in Letchworth the venue for today’s final home of Hertfordshire FA, the stadium recently undergoing some redevelopment including a new 3G playing surface replacing the grass pitch, barriers and surround upgraded. A redeveloped clubhouse area too, a new cafe replacing the old bar with function room beyond. Hot and cold drinks available. An early kick-off, breakfast too a burger van selling hot food in it’s usual berth. Storm Hannah the latest to blow through the UK bringing over night wind and rain. A 3G surface meaning a call off unlikely cool early on and overcast dark clouds threatening the rain would hold off the sun breaking through. Stevenage Ladies starting XI – Hannah Vandersluis, Hayley Wood-Thompson, Poppy Bennett, Dominique Godbeer, Charlotte Ryan, Shona Chitate, Amy Josland, Ashleigh Deacon, Ellie Searle, Amy Makewell (C) & Nicole Emmings. Subs – Kristi Burling, Amy Runicman, Melody Jones, Cara Breckenridge & Erin Pope. 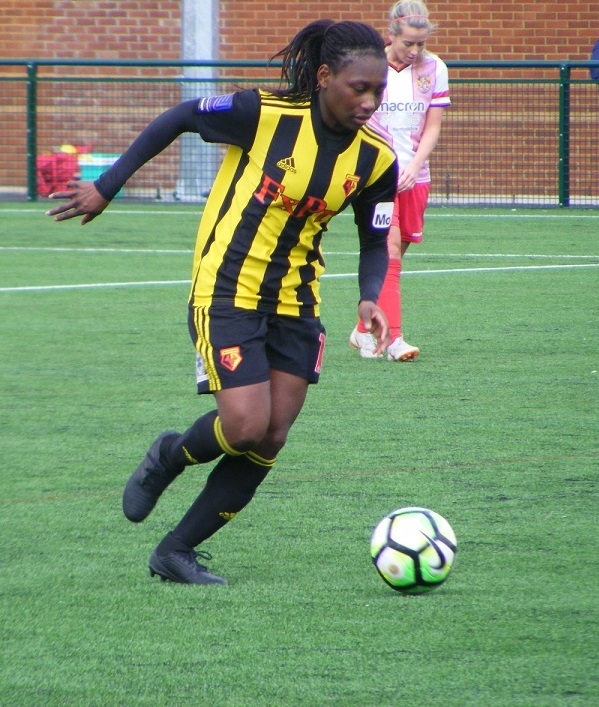 Watford Ladies U23s starting XI – Amy Martin, Ayifa Johnson, Holly Holt, Danielle Maloney, Sydney Hinchcliffe, Katie Akerman, Rebecca McShane (C), Andie Dickens, Linda Afuakwah, Eshe Johnson & Anaisa Harvey. Subs – Jennifer Hughes, Jessica Biggerstaff, Hannah Coote, Holly Greenwood & Alketa Rragami. It’s Stevenage to get the final underway kicking off first half wearing white shirts with light red vertical stripes, red shirts and socks with Watford lined up opposite wearing yellow and black vertical striped shirts, black shorts and socks. 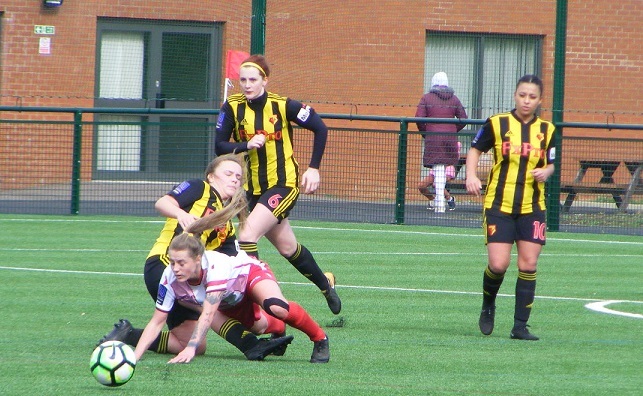 Watford press early Andie Dickens on the left win tackling winning possession getting in behind to cross Charlotte Ryan clearing the ball inside her area for Stevenage. 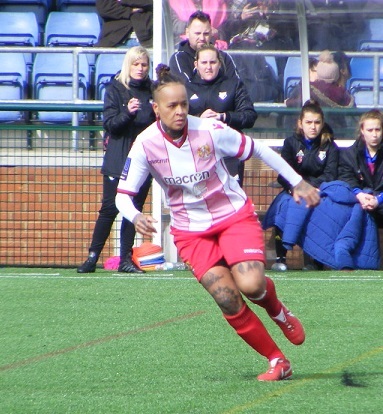 Nicole Emmings receiving the ball in attack for Stevenage turns to her left sending the ball on down the line with Ellie Searle looking to break in behind, Afiya Johnson getting back well to make the tackle. Stevenage are awarded an early free-kick 35 yards out central Shona Chitate to take the ball put into the area for runners to attack, Watford goalkeeper Amy Martin taking it on the bounce. Watford press the ball high up the pitch, Stevenage rushed into their passes Poppy Bennett’s forwards ball up to Emmings, Sydney Hinchcliffe doing well up against her for Watford preventing the attacker getting in on goal. A bright start from Watford, lively early on closing Stevenage down quick to mount attacks, Emmings and captain Amy Makewell looking to move around find space up top for Stevenage to play them in. Linda Afuakwah with the ball at her feet for Watford on the right drives down the line cutting inside get’s past one defender the ball coming to Eshe Johnson near post she blasts wide from six yards out. 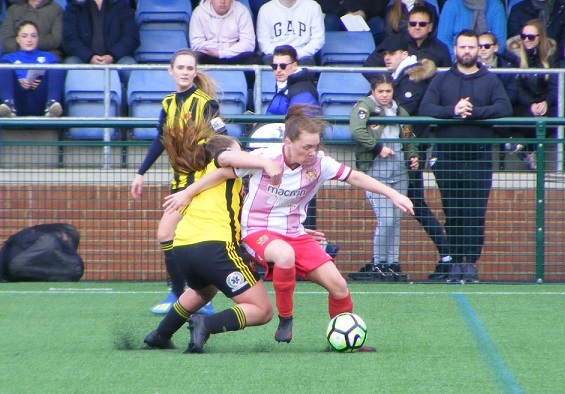 A quick turn around from Stevenage the ball from Amy Josland through the middle helped on to Emmings peeling away into a gap on the left runs on into the area the shot on Emmings instead puts it in towards the penalty spot, her cross intercepted as Watford get back the ball sent clear. Emmings is through clear in behind moment later central 30 yards out gives chase to the ball, Martin racing out of her area gets there first however to kick the ball away before the striker can capitalise. Watford get on down the left the cross in headed behind for a corner kick, the delivery near post attacked ends up behind for a 2nd corner, this one again from the left higher Vandersluis getting up to glove the ball on wide and behind for a 3rd corner on the right this time. GOAL! Watford open the scoring from the corner put in towards the near post area 8 yards out the ball is turned back in towards goal, Stevenage doing well initially to clear the ball off the line the clearance out to the left falling straight to Watford’s Hinchcliffe the centre back smashing a low shot back across goal into the back of the net 0-1. Amy Makewell carries the ball on down the right, is stopped by Watford’s Holly Holt. 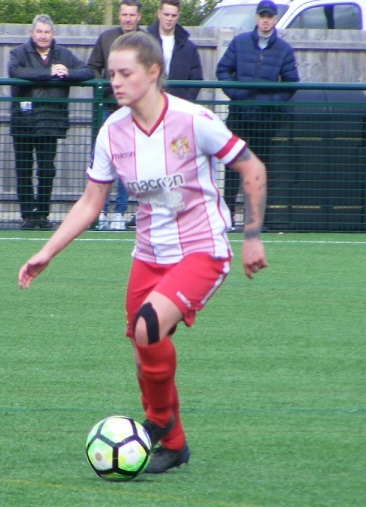 Ashleigh Deacon combines with Chitate as Stevenage try to play Makewell in behind, play brought back by referee Lyn McGregor after there was no advantage after Chitate was fouled. Ryan over the free kick inside the Watford half as players go forwards, the delivery high into the area punched down by martin falls straight to Dominique Godbeer positioned just inside the area catches it on the volley her attempt over the bar. A good response from Stevenage having fallen behind Josland and Chitate enjoying a competitive battle with Watford captain Rebecca McShane and Katie Akerman. Challenges a plenty. Afuakwah on the ball right for Watford lays it on through the middle for Harvey, the striker unable to gather the ball races through into the area Dickens lively after it, Hayley Wood-Thompson back with her the Stevenage full back putting Dickens under pressure as she blasts her shot wide. Afuakwah is fouled by Searle outside the area 20 out right of the D, Dickens over it with an early shot over the wall striking the base of the near post… but she had gone to soon wait for the whistle, retaken Dickens puts it over this time. Makewell taking the ball on down the right a powerful run turns inside getting into the box, is eventually stopped as 3 Watford defenders converge to close her down six yards out. Watford quick to counter Afuakwah a ready outlet on their right down the line her cross in cleared by Godbeer. Stevenage return the counter attack with interest putting Searle in on the left closing in on the area her cross inside only finding the Watford defence. Makewell drags a shot wide from the top of the area, the flag raised against her however. Makewell linking with Deacon for Stevenage as Emmings breaks down the right wins a corner. The delivery well played drops into the six yard box Deacon with her back to goal closely marked by Martin can’t get around her to shoot the ball scrambled away to the right Makewell drives a shot back in the effort narrowly wide. Play turned around quickly fro both sides the game played at a good tempo, Hinchcliffe with some great defending on Makewell as she is played through on goal centrally. Appeals for handball waved away as Stevenage press Watford outside their area, Hinchcliffe’s arm raised as Makewell attempts to flick it on. A free kick for Stevenage on halfway knocked on by Josland puts Deacon in behind right into the box, Martin out to close her down saves well at her feet, the ball knocked away Martin grounded pouncing to claim the loose ball. 40 minutes played. GOAL! Watford have dealt with a spell of pressure from Stevenage well breaking forwards double their lead just before half-time the ball knocked on is into Dickens on the left just outside the area hits the ball well arrowing in towards goal Vandersluis dives to her left full stretch but can’t keep it out as the ball squeezes inside the post 0-2. Plenty of rubber in the new pitch flying up as sliding tackles come in, lively Stevenage getting frustrated with some decisions. Afiya Johnson forwards to support Eshe and Afuakwah on the right the trio win a corner, played long to the top of the box a shot driven in Vandersluis diving the ball behind for another set piece this time Stevenage defend break on the counter, Josland on for Emmings, Danielle Maloney defends for Watford. Stevenage with a free-kick at the end of the first half the ball defended in the box by Watford’s Afuakwah she brings it away the ball played on to Eshe Johnson she plays it through for Harvey who is tackled by Godbeer, McShane bursting forwards regaining possession picks out Afuakwah into space on the right full of pace takes the ball on into the box blasting a rising shot into the side netting. A 2-0 lead for Watford at half-time a bright start pressing the ball, forcing their opponents into rushed passes took the early lead, defended well as Stevenage sought to find gaps in behind created opportunities to find an equalising goal the temp high throughout Watford dealing with the pressure ready to go on the attack hit a 2nd late in the first half to give themselves a good platform to build on 2nd half. Stevenage will want to come out of the blocks strong at the start of the 2nd period if they want to get back into the game. It’s Watford to get the 2nd half underway, Stevenage in to get on the ball, Chitate with Bennett the ball launched forwards with Emmings running clear in behind left channel Martin coming out to close the angle saving well getting her gloves onto the ball. Emmings appeals for a penalty as she ends up on the ground inside the box trying to see the ball into her body from a Searle throw in on the right, the appeals waved away. Josland gets across to tackle Afuakwah as Eshe Johnson aims to send her away on the right. Bennett is down with a knock for Stevenage, an early change in the 2nd half as she comes off, on in her place Cara Breckenridge. Searle making ground on the left wing for Stevenage a cross in low across the face of goal from deep Emmings diving to head the ball just misses it at the near post the ball racing on. Akerman bringing the ball on for Watford through the middle plays it forwards with Eshe Johnson pulling away right shoots early from outside the area, Vandersluis claims it. A good start to the 2nd half for Stevenage they press forwards, Holt and Maloney both denying final balls for Watford. A throw won on the left played into Josland the Stevenage midfielder shooting from 20 yards out left her strike held into Martins midriff. Watford counter the ball central played out to Dickens left has Holt breaking ahead of her on the overlap the fullback turning inside central closing in on the D, thinks about shooting instead attempts to thread it through for Harvey the Stevenage defence shutting the door the clearance intercepted by Akerman 30 yards out given time to line up a shot her strike doesn’t trouble Vandersluis. Emmings closing down Watford at the back wins the ball outside the box a snap shot right of the D races wide. play brought back after no advantage from a foul Watford have a free-kick 25 yards out to the left of goal, Maloney on it goes for goal the attempt landing wide of the near post. An hour on the clock Stevenage make a 2nd change with Erin Pope coming on for Josland. 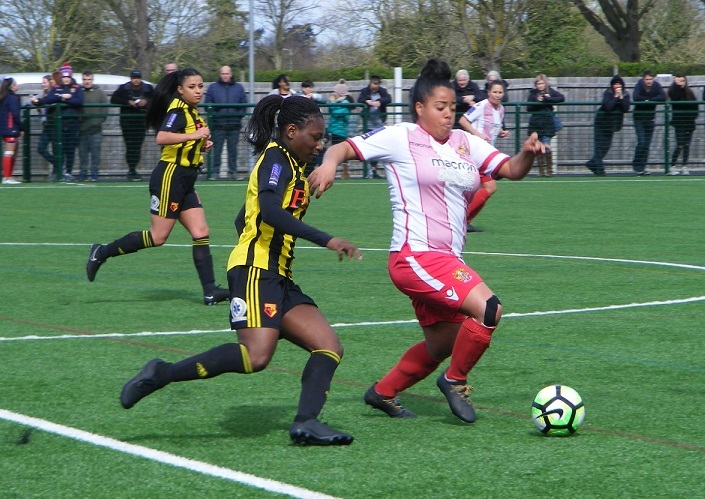 Afuakwah central runs in behind the Stevenage defence 25 yards out as Vandersluis comes to narrow the angle the Watford attacker shoots her effort past the keeper runs wide of the post. GOAL! A corner won on the left as Akerman winning the tackle in midfield plays it out to Dickens on the left support from Holt who gets the corner. The delivery on the spot into the middle of the six yard box 3 Watford players attack it Hinchcliffe, Eshe Johnson and between them Harvey who gets up highest to head the ball down and in to make it 0-3. Stevenage make another change Chitate coming off on comes Amy Runicman to join the attack. A minute later Watford make a change and it’s the goalscorer coming off Harvey replaced by Jennifer Hughes. A free-kick wide right for Stevenage, Makewell plays in towards the far post Martin up to glove the ball away for a corner kick, delayed as the trainer comes on for an injury. Watford defending the set piece break Afuakwah through the centre now on for Hughes peeling into space on the left her cross into the box cut out, Eshe Johnson bundled over as she tries to collect just outside the D. Akerman with the free-kick her shot no trouble for Vandersluis. Emmings after a forwards pass on her right checks inside to get into the area, Hinchcliffe challenging the ball put behind for a corner. In from the right to the near post area Runicman gets over the ball shooting held safely as Martin gets across. Stevenage getting frustrated Watford working hard to keep up the tempo challenge for everything, decisions not going Stevenage’s way. Afuakwah run of running with the ball has Hughes to her right giving her the ball she shoots 20 yards out Vandersluis going to ground pushing the ball behind at the near post. Makewell and Emmings link up get Deacon in on the left her shot outside the box charged down. GOAL! Counter attacking play from Watford leads to a 4th goal Stevenage pushing for a goal are hit on the break the ball put n quickly for Eshe Johnson through the centre clear on goal closing in on the area right of the D, composed as Vandersluis moves towards her, the striker placing the ball wide of the keeper and into the bottom corner with less than 20 minutes to play 0-4. Makewell tries to get Pope in on goal as she breaks through the middle, she sees Searle getting clear on the left tries to play the pass through, McShane backtracking doing well to intercept get the ball back to her keeper. 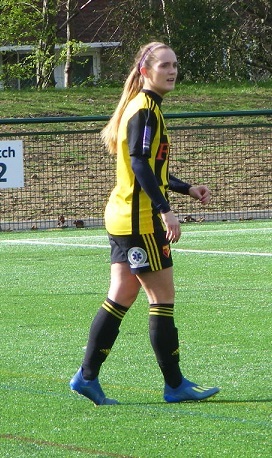 Watford with a change as Dickens comes off Hannah Coote going over to her position on the left. Coote with an early chance as she is played in with a crossfield pass, lets fly from 25 yards out, Vandersluis with a great save diving to her right to push the ball wide for a corner. Watford’s turn to appeal for a penalty as the ball comes into the area, play goes on cleared out of the box collected by Hughes on the right sends a cross back in to the far post Maloney up to meet it sends her header wide. Watford think they’ve scored a 5th as the ball is put over the top Vandersluis saving the first strike Afuakwah burying the rebound. The celebrations cut short however assistant Gemma Smith with her flag up and early too before Vandersluis blocked the first attempt no goal. Afuakwah comes off with Watford’s top scorer Jessica Biggerstaff coming on. Biggerstaff getting in on the action straight away as she runs on through to send a shot into the side netting. Afiya Johnson linking with Hughes on the right the ball taken to the byline cut back centrally Eshe Johnson with the shot Vandersluis with a superb save. Tempers getting a little frayed Stevenage have been frustrated by their opponents Searle collecting a yellow card. 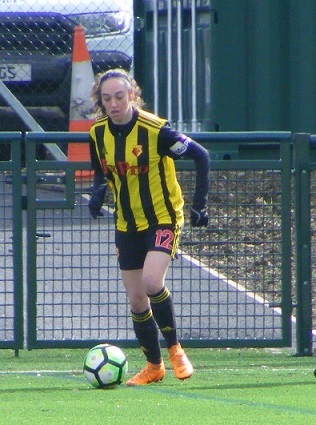 A double change late in proceedings for Watford, Eshe Johnson and McShane off, on come Alketa Rragami and Holly Greenwood. Watford finish strong Biggerstaff with space in the box sees her shot deflected onto the keeper to spin away for a corner. A push in the back spotted as Watford play it in. Stevenage with a corner in stoppage time on the left the ball in Searle up to meet it near side her header wide across the face of goal. 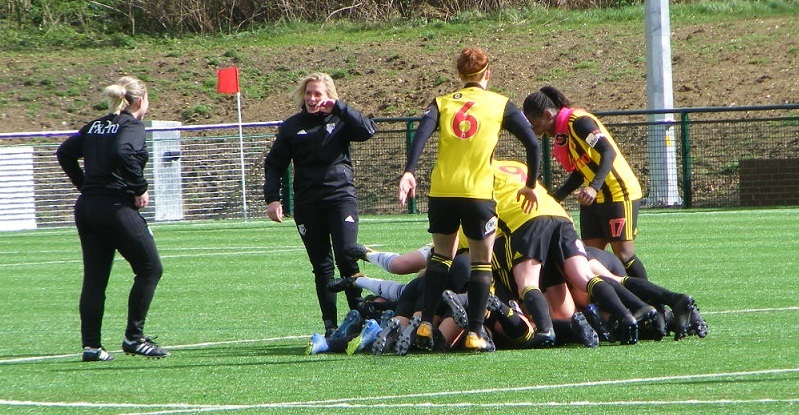 The final whistle blows and Watford Ladies U23s bundle atop one another in celebration as they win the Hertfordshire Women’s Challenge Cup. A fantastic result for Watford’s U23s played well throughout a bright start pressing well, restricting the time their opponents had on the ball getting in front early on Stevenage responding well fighting back didn’t get the decisions growing frustrated as opportunities wen by Watford doubling their lead before half-time. Stevenage you felt needed the next goal as it was Watford were the side to find the back of the net to go 3-0 up. Stevenage could not find a reply to pressure the scoreline Watford strong as they took a 4 goal lead never looking back. Onto this Sunday’s Women’s Football east – Player of the Match award. 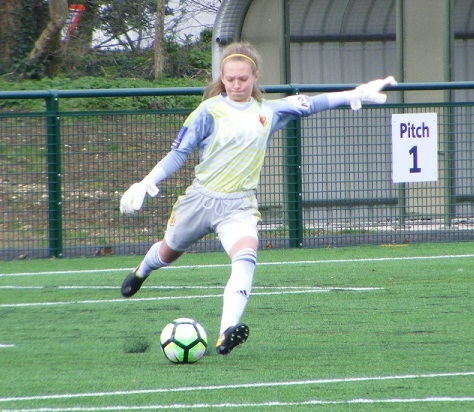 A good performance all round from Watford Ladies U23s putting some good attacking moves together, defending well, Amy Martin with some very confident and brave goalkeeping. Have chosen Linda Afuakwah was a threat throughout on the right then through the middle making some great runs taking players on and creating chances, always an outlet making herself available whenever Watford won the ball. 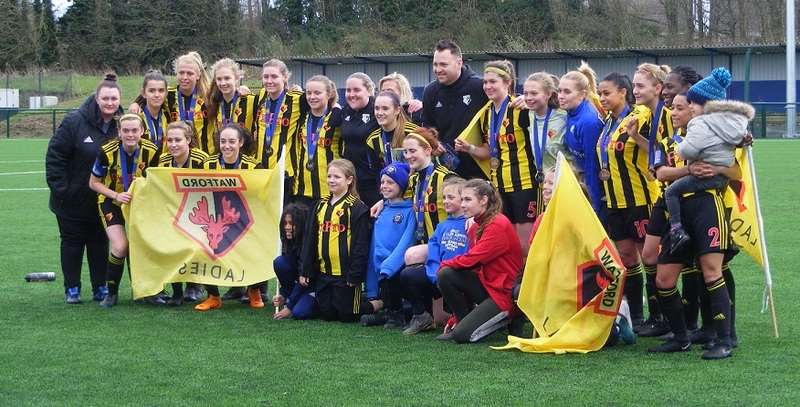 Congratulations to Watford Ladies U23s on winning the Hertfordshire Women’s Challenge Cup. An early kick-off, managed to avoid the torrential down pour that came after the game. A match report finished before 10pm is a rarity too but lots to do, the finals coming thick and fast now the next on Tuesday. An entertaining match a good number coming to watch, my thanks to Hertfordshire FA for all their help today, much appreciated. 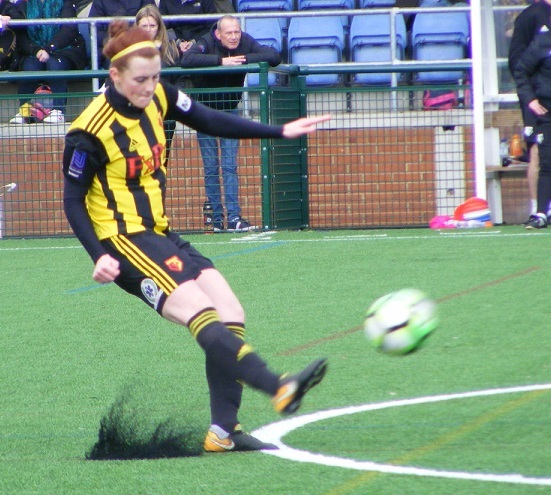 This entry was posted in Hertfordshire Women's County Cup, Match Reports and tagged Hertfordshire Women's County Cup, Match Report, Stevenage Ladies, Watford Ladies on March 17, 2019 by WFEast.